Notwithstanding the health and environmental woes that Ebola has brought upon the people of Sierra Leone, we now have the added problem of Ebola producing a new generation of illiterate citizens. 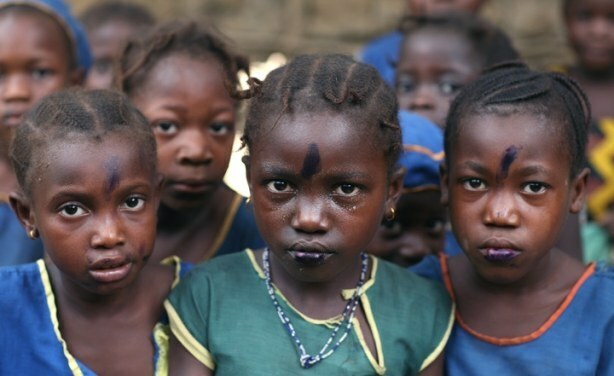 Over two million children are today unable to attend school. In the last few days, the world has finally woken up to the realities of the ebola virus disease (EVD), acknowledging that it poses as great a risk to humanity as HIV/Aids. And it seems at long last, efforts are now being made to curtail the human disaster that is unfolding in front of our very eyes. At a recent meeting of finance ministers in Washington DC, hosted by the World Bank and the International Monetary Fund (IMF), a £300 million funding package was announced to help fight the virus. This money will be used to fund treatment, isolation and medical centres across Sierra Leone, Guinea and Liberia, that have bore the brunt of EVD. Can some of this funding be used to establish and maintain an ‘education by radio’ initiative for children currently at home, unable to attend school? Fully conscious of the very rapid pace with which the virus spreads, world leaders are sending personnel to the three affected countries to help with containment. They hope that with these new measures, numbers will start to drop from January, and after that, begin to decline. 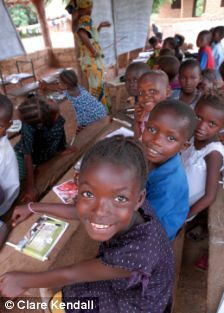 In Sierra Leone, all schools currently remain closed as a result of the virus. Although this is seen as a good control measure, yet it poses serious long-term risks for the country’s human and economic development. Schools are not likely to re-open until the second quarter of 2015, meaning that pupils will miss almost a year of academic studies. Conscious of the long term potential impact on the country’s socio-economic development, the government has launched an ambitious education project to ensure that 1 million school children can have access to continuing education, while this pandemic lasts. Under the proposed initiative – known as the ‘Remote Education Access CHannel (REACH)’ Programme, pupils will receive tuition through radio broadcasts in a variety of subjects, for four hours, six days a week, aired by 41 radio stations and the country’s sole television channel. Sierra Leone’s schools have been closed since the government announced a state of emergency in July 2014, in response to the scourge that has led to the death of over 600 Sierra Leoneans. More than 2 million of the total population of 5.7 million are aged between 3 years and 17 years. And although secondary school attendance is less than 40% for both boys and girls, it would be catastrophic and irresponsible not to do something about ensuring their continuing education at this difficult time. 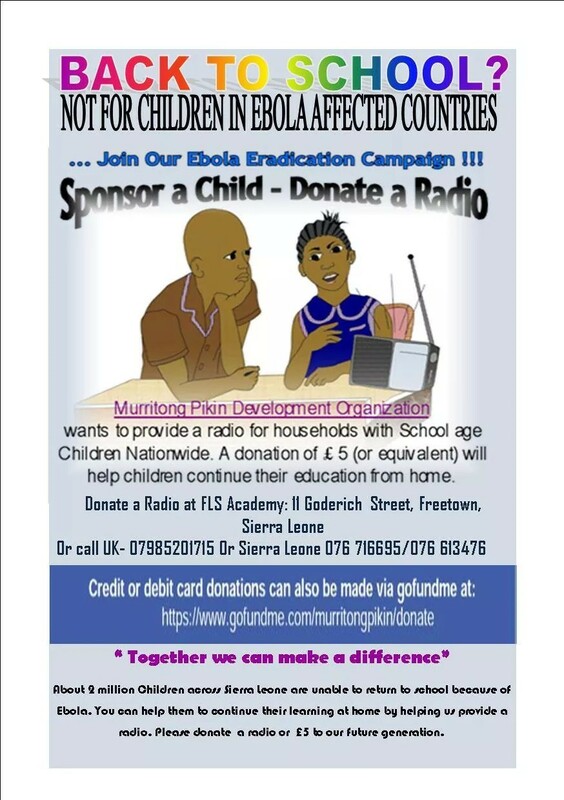 Dr Bah admitted that reaching many of Sierra Leone’s school children would be challenging, as radio ownership is only about 25%, with fewer than 2% of the population having access to a television. 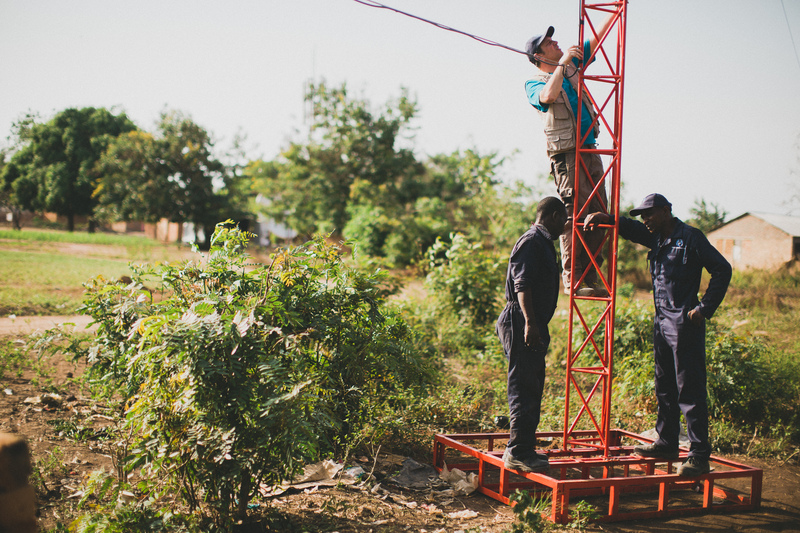 Also, in most rural communities, poor radio signal make it impossible to access broadcasts. There is also the added difficulty of short battery-life for radiosets. Batteries are very expensive and beyond the affordability of millions of households. 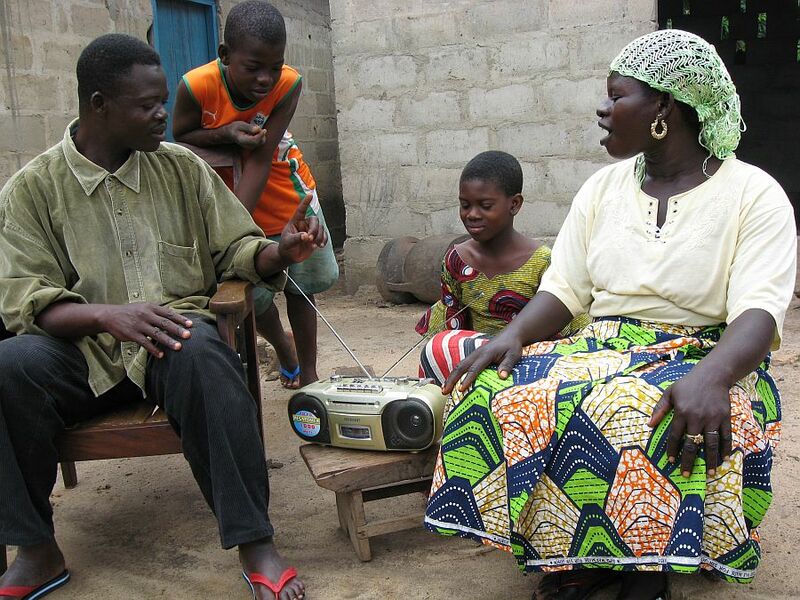 In an interview with the Awoko Newspaper last July about the challenges of radio stations in conveying the Ebola message, Station Manager of Radio Gbafth in Mile 91 – Hassan Y. Koroma said that, the major challenge faced by some community radio stations is the strength of the signal, which requires improvement. But, the minister of education is intent on ensuring that all school children can have access to a radioset, so as to continue their learning until the end of the state of emergency. Manuel Fontaine, the regional director of UN children’s fund – Unicef, which is supporting the initiative, said the radio classes would be focussed on teaching children life skills and maintaining their contact with the outside world. Dr Bah added that his ministry would be finding other means of accommodating the needs of the hard-to-reach areas that are without access to radio. With large swathes of rural Sierra Leone lacking basic amenities like roads, power supply and access to television, this is a huge undertaking Dr Bah and his colleagues are embarking on. A former academic himself, whose most recent job was as a lecturer at Fourah bay College, Dr Bah is not new to the challenges Sierra Leone’s education sector faces. But this task is onerous. One way of addressing the crisis is to get radios and batteries distributed to outlying areas, as a way of linking children in these areas with the proposed ‘Remote Education Access CHannel (REACH)’ Programme. But this initiative needs funding if it is to take off. Unlike neighbouring Ghana and Nigeria where Internet access and mobile telephone usage is widespread, Sierra Leone is not really integrated into the global digital village. Dr Bah could request some of the $300 million coming from the IMF and World Bank, so as to purchase the radios – especially manually winding radio. Unicef could also be approached to provide TV and radiosets, although the reality is that whatever is donated will be well short of demand. But with the best will in the world, nothing is an ideal substitute for getting Sierra Leone’s children back into school, and this will only happen when the medical authorities sound the all-clear. With about 4,000 US troops deployed to West Africa, the international community donating $300 million, and the CDC finally getting the world’s attention, hopefully, this will be sooner than later. Sierra Leone is currently standing on the precipice, as the combination of a dangerous epidemic and its accompanying socio-economic woes threaten to engulf the whole country. However, we must not relent or despair, as the fightback has begun, and we need all our fortitude to believe that we will come out of this battle victorious. Zainab Tunkara Clarkson (Photo) is a Development Consultant and heads the program for The Organisation of Women Networks for Entrepreneurs (Owners) – a national network of female entrepreneurs in Sierra Leone which seeks to empower women in business. She has worked extensively in private, public and civil Society sectors across UK in Senior Management positions. Zainab is a strong advocate for Race and Gender Equality and the welfare of African Children and she is an expert in the field of diversity issues. Zainab currently serves as a Trustee on the Board of the Greenwich Inclusion Project, as well as AFRUCA – Africans Unite against Child Abuse (UK). 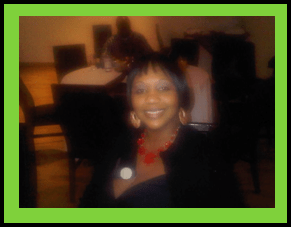 Ms Tunkara Clarkson is also a Board Member of Teach For Sierra Leone. She is the Children and Gender Editor and Marketing Director of Voices from the Diaspora Radio Network. She has a BA degree in Business and Marketing from Sussex University, a postgraduate degree in NGO and International Development Management from the University of East London and a post graduate Diploma in Public Health. Even though nothing can replace face to face delivery of lessons, I think this initiative is great because it recognizes the need for continued education in the face of adversity in our ebola crisis situation and creates the space for a semblance of educational normalcy. I am a great proponent of student-centered learning but think this is not happening yet in most of our schools much less via a radio program. I think as the radio programs progress, producers should ensure that they engage with progressive educationists who will guide them in the production of these teaching materials. The aim shouldn’t be just to transmit knowledge, education is about creating knowledge together. At the best of times it is so difficult to get parents of children in the remote villages to send their kids to school. This is going to be a real setback in our education system. I hope that we are able to contain this dreadful disease so that kids can go back to school. We need to make the necessary provisions for the schools. Well resourced school libraries will be of immense help. Some good points. It is important to recognise that radio has the widest reach. However, the government could also work with the telephone companies to use either SMS or more reacher content to help with the learning. We at the African Virtual School are playing our part with free “Essential Maths and Essential English” courses that we created with our partner Sondiata Global Media.